Alaska Cruises - interesting facts regarding America's largest state and one of the most popular cruise destinations. Alaska hosts hundreds of cruise ships each year, carrying thousands of cruise ship vacationers, explorers and sightseers across its vast navigable coastline. The busiest season for Alaska Cruise wayfarers is between May and September when cruise vacations from discount to all inclusive alaska cruises tour up and down the state, viewing the breathtaking scenery while stopping along several popular ports. Some companies provide Alaska Cruise Specials in late April and early October during the offseason when travelers can take advantage of Discount Cruises to Alaska. Generally, an Alaska Cruise is 7 to 14 days in length, and explores one of the two major routes; Alaska's Inner Passage in the Southeast or the glacier cruises through south central Alaska. Your schedule, budget, and preferences may dictate your ideal time for an Alaska cruise keeping in mind weather and seasonal factors including the amount of Alaskan daylight hours. Call today to discuss our Alaska Cruise Specials including current available discounts. 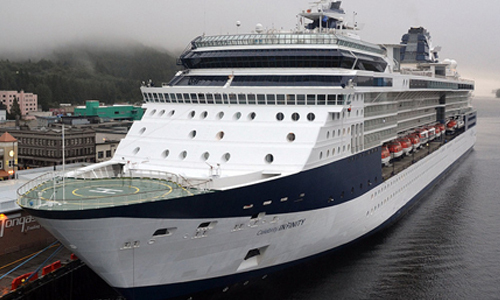 Offers Alaska Cruises with Five-star dining, high rated entertainment and white gloved service at discount prices on Celebrity Cruises to Alaska. Royal Caribbean Alaskan Cruises to Alaska offers all inclusive land excursions and meals as well as transfers. Experts in Alaska cruising, you can't go wrong when selecting an all inclusive Princess cruise trip to Alaska. Experience "Freestyle" Cruising when sailing onboard Norwegian Cruise Line to Alaska. All inclusive discount cruise packages to Alaska are available at Holland America, the ideal choice for cruising to Alaska. Everything is included! Land Excursions, Food, Tips, All inclusive Trip and Alaska Cruise by Regent Seven Seas. Offers excellent Alaska Cruises at Discounts. Be sure ask about out Discounted Packages with Oceania Cruises. Book your Alaska cruise vacation through the experts at alaskacruises.travel Thank you for visiting AlaskaCruises.Travel. By booking your cruise to Alaska through our website or by calling our toll-free number at 1-800-352-8088, you can be assured that you will receive the most competitive rates in the industry along with the highest professional quality service. We offer all inclusive Alaska Discount Cruise Packages. Please search our website, explore our blog or contact us at anytime at 1-800-352-8088. Alaska cruise vacation packages are one of the most effective and affordable ways to see Alaska. Choose the right Alaska cruise vacation package and you will see the great Alaskan glaciers, America's most pristine national parks, and an abundance of wildlife - all from the majesty of incredible ships, private rail service and exclusive wilderness lodges. Call now and inquire about our Alaska cruise vacation package deals and discounts. Click Here to view the latest Alaska Cruise Deals.